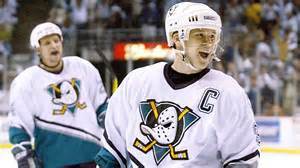 The National Association of Japanese Canadians and its 17-member organization sends its congratulations to Vancouver born Paul Kariya for being selected to The Hockey Hall of Fame. We are equally proud that Paul is the first inductee of Asian heritage and the first Japanese Canadian. Paul’s hockey style was reminiscent of the Asahi Baseball team of the 1930s who played a courteous but a tactical style of game dubbed “brain baseball”. Sport writers have described Paul as a skilled, fast skating player who brought a cerebral element to the game. He had an innate hockey sense that seemed to attract pucks. As a recipient of the Lady Byng Trophy in 1996 and 1997 – given to the most gentlemanly player – it reflects his personal standards in a physically demanding sport. It is timely that Paul will be inducted this year as the Japanese Canadian community commemorates: the 100th anniversary of the Japanese Canadian soldiers who fought at Vimy Ridge, the 75th anniversary of the incarceration of 22,000 Japanese Canadians and the 70th anniversary of the founding of the NAJC. Paul’s father was born in an incarceration camp and his uncle has been a supporter of the NAJC. We are hopeful that the next inductee to the Hall will be Vicky Sunahara who has been eligible since 2010. Vicky is a trailblazer in Canadian women’s hockey who has won 9 gold medals and 2 silvers and has devoted her life to the sport.